Just as acquisition speculation is heating up, Twitter has gotten a bit of its mojo back. It can largely thank a few weeks of livestreaming high-interest events, namely the NFL's Thursday Night Football and Monday night's presidential debate. 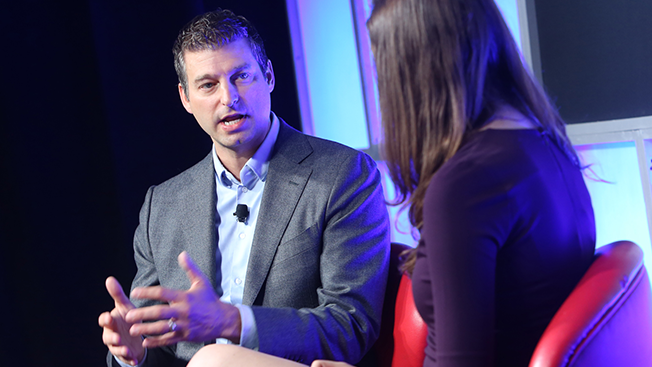 "It's an extension of what we've always been doing," said Adam Bain, Twitter COO, speaking in front of a few hundred people at IAB Mixx in New York Tuesday morning. "You should view it as we are just getting started in the live [space]." In recent months, Twitter has been busy inking deals with the NFL, MLB, the NHL, the NBA, the NCAA's Pac-12 Conference, Bloomberg Media, CBS News and Cheddar. The moves are designed to make Twitter both an alternative to linear TV and a complementary feature to it. "TV is still absolute king," Bain said. But his platform is there, he said, for "people cutting or shaving the cord." The company's NFL deal provides plenty of hope. Twitter said there were 2.4 million viewers for its Thursday Night Football livestream on Sept. 22 compared to 2.3 million the first time it aired a week earlier. Whether Twitter can regularly attract major eyeballs for non-NFL content—or for events other than those that only take place every four years like the election—remains to be seen. A key move toward attracting a bigger audience, Bain suggested, was making the logged-out experience on Twitter "nearly identical" to logged-in viewing. Everyone sees the content and real-time tweets about the action, which, for Twitter's sake, hopefully will draw more viewers to the platform who are not part of its 310 million monthly users. Meanwhile, Monday night's debate was buzzy this morning nearly everywhere online and offline—from the halls of the IAB event at Times Square's Crowne Plaza Hotel to the controversial #TrumpWon hashtag on Twitter. During the 89-minute debate, the social chatter was palpable. According to SocialFlow, there were more than 3 million mentions of Donald Trump and Hillary Clinton during the debate on Twitter, with the Democratic nominee generating 233,000 more mentions. "It was the most-tweeted debate ever," Bain said. "It was probably our biggest livestream." Twitter hadn't released viewer numbers at press time. But a Twitter acquisition may be looming, with Disney, Salesforce and Google reportedly making bids to acquire the company. Bain, who was interviewed at IAB Mixx by Bloomberg tech reporter Sarah Frier, didn't directly comment on that. The independent event typically coincides with Advertising Week, which runs through Thursday.